Found this great online Flash game called 'Skirmish'. Shoot your enemies with your paintball gun. The games gets progressively tougher as you move up the different stages. It was a bit sluggish when I played - not sure whether it was due to my connection or my computer. 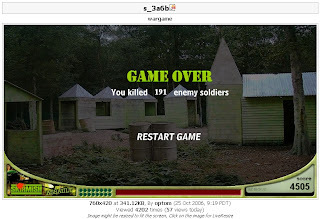 I killed 191 enemy soldiers and my score is 4505 (on my first try). Got this via the GadgetLite Blog. Yesterday I scored more than 5000 soon after. Thanks for dropping by my blog.